Living a Refugee Life in Sajjangarh, Ustad aka T24 could find a bigger and better home..
2017 can prove to be a good year for Ustad aka T 24. After living a refugee life in Sajjangarh's zoo for over a year, Ustad might relocate to a new 50-hectare area. Currently, Ustad is enclosed in the 1-hectare Sajjangarh zoo chamber for killing the forest guard named Rampal Saini. In 2012, he had killed another guard and was also held responsible for the deaths of two other people who ventured into his territory. The hints of the translocation were given by the Rajasthan’s minister of environment and wildlife Gajendra Singh Khimsar after a review meeting on Tuesday. Gajendra Singh Khimsar revealed to the media that arrangements are being made to get a bigger and better home for Ustad as the enclosure is too small for him. Before the translocation, Ustad will go through a blood test, and on the basis of that report, his future will be decided. 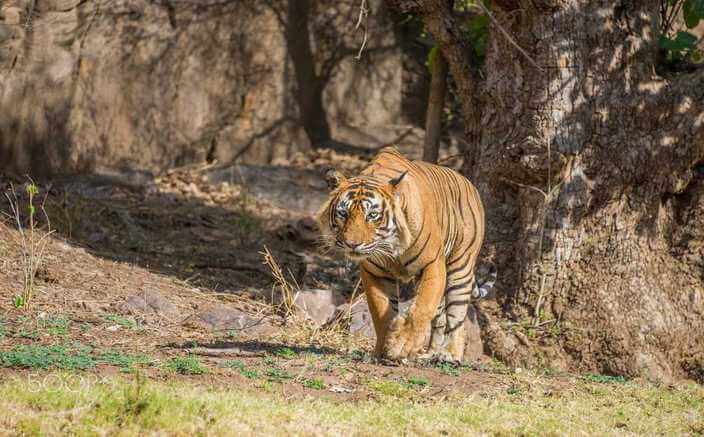 The forest department has insisted on keeping the tiger at Sajjangarh so as to monitor his health as he has been suffering from several health complications ever since he was brought to Udaipur in 2015 from his 5,000-hectare home in Ranthambore National Park. He might be sent released into a large enclosure, within Saris or some other reserve. But definitely not in Ranthambore as he could still be dangerous for humans. Keeping checking this site to know updated news on Ranthambore National Park.